The third film directed by Zhang Yimou, Judou forms the the second part of the trilogy of period melodramas that the director made with the young Gong Li. It followed Red Sorghum (1987) and preceded Raise the Red Lantern (1991). Viewed in 2007 when director and star have been reunited on the third part of another, rather different, trilogy with The Curse of the Golden Flower, Judou reminds us of both the range of Zhang Yimou’s visual imagination and of his central role in the renewal of Chinese Cinema after the rigours of the Cultural Revolution. 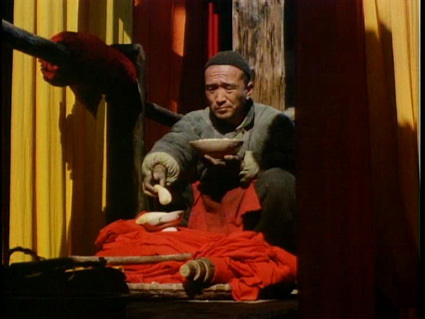 The first film of the Fifth Generation of Chinese directors to reach the West and to receive major critical attention was Yellow Earth (1984) directed by Chen Kaige. The striking visual qualities of that film, and of Chen’s follow-up, The Big Parade from 1986, were both attributable in large part to the cinematography of his classmate Zhang Yimou. Zhang also appeared as an actor in the Old Well (1986) and when he moved into directing he shared the credit with his colleague Yang Fengliang on Judou, as he had on the commercial thriller Codename Cougar (1989). Despite the joint credit, Judou has always been seen as primarily a ‘Zhang Yimou film’. Zhang did not photograph his own films and on Red Sorghum and Judou he worked with Gu Changwei. Yang Lun, who photographed Raise the Red Lantern, also worked on Judou. Unlike Chen and Tian Zhuangzhuang, the other Fifth Generation director to achieve critical acclaim in the West, Zhang was from a ‘bad class background’ and he struggled to be accepted for the Film Academy. All the Fifth Generation films challenged the orthodoxy of cinema in the People’s Republic since 1949, but Zhang’s did so by means of revitalising the female-centred melodrama and the attractions of traditional genre cinema, presented by a visual artist with a genius for colour and composition. Where Chen and Tian might explore more ostensibly cerebral issues, Zhang’s approach was seemingly more basic in its appeal to eroticism and visual splendour. Red Sorghum mixed family melodrama and the war with Japan in the 1930s and proved to be a massive commercial success in China. Its success overseas also enabled Zhang to get funding for Judou (mainly from Japan) and Raise the Red Lantern, films that were then viewed in the West as ‘arthouse’. The theme of all the films in the trilogy is the oppression of young women in the highly patriarchal system of China in the 1920s and 1930s. The popular success of Red Sorghum was not repeated in China with Judou, largely it would seem because the film fell foul of the Communist Party censors. There are major problems with any discussion of how films like Judou played in China on their release. We have little access to any reliable statistics on film distribution and audience numbers. The decisions taken by the censors in this period are not explained and do not seem to be consistent. Decisions may be made for personal, idiosyncratic reasons or because of changes in Communist Party policies. (Tony Rayns in the Monthly Film Bulletin review of Judou in April 1991 suggested that the official concerned had no real knowledge of film culture as such.) The result is that Western commentaries on Zhang’s career have often depended on perceptions of how the films were being seen by the authorities in Beijing. Films like Judou were perhaps more warmly received because they were thought to be banned in China, whereas later films such as The Story of Qiu Ju (1992), also starring Gong Li and written by Liu Heng, author of the novella Judou, were treated with some suspicion because they were thought to be ‘Party approved’. Zhang Yimou is a visualiser, a creator of filmic narratives most often developed from previously published stories. All three films of the trilogy are based on stories that had been published only a few months before the films’ release. Zhang’s skill is in presenting the stories in a visual way and this he achieves through careful collaborative work with cinematographers and production designers. Judou is primarily about the use of sets rather than landscapes and much of the action is shot in the enclosed spaces of the dye works. As Rayns suggests, this inverts the approach taken in Red Sorghum where the action is often viewed from outside the brewery. But it is followed by a similarly ‘interior drama’ in Raise the Red Lantern. Also inverted is the sense of lives destroyed by outside forces (i.e. the Japanese invaders) in Red Sorghum. In the two succeeding films, the impetus for destruction comes from within. Judou feels ‘modern’ in its direct representation of the emotional (and sexual) lives of its characters, yet visually it draws on compositions that evoke earlier films from international cinema. The set is very well-used. Rayns points to the way in which Zhang denies us a coherent sense of the layout of the dye works. We are aware only of the importance of the loft, the cellar, the stable, the tank in which the dyes are mixed, the winding gear for the drying racks etc. The cinematography shows us the processes in a montage style reminiscent of Soviet Cinema of the 1920s/30s but it signals emotional turmoil rather than craft and industry. Traditional Chinese art did not of course follow the perspectives of Western art post the Renaissance, so, in compositional terms, the influence of such portrait painting ideas would automatically create tensions within a cinematic presentation (i.e. the representation of 3D space in a 2D medium). This perhaps explains why Judou sometimes feels ‘odd’. Zhang uses a number of ‘flat’, head-on formal compostions as well as several high and low angles. This play with the depth of the image is also affected by the use of lighting. Kwok Wah Lau argues that whereas conventional Western lighting techniques are used to ‘sculpt’ the image, creating depth, Zhang uses lighting in Judou to emphasise the two-dimensionality of the painting style. The result of this approach is that more emphasis is placed on colour. Judou is first and foremost a narrative that uses colour – it is set in a dye works! In this respect it is worth considering the film alongside Hero – another occasion in which colour is primary, but one in which the functional basis for the division into different ‘story colours’ is more obvious. In Judou the use of reds and yellows and blues and blacks is much more subtle, though no less beautiful. In 1991 when the film appeared in the West it provoked admiring comments from film critics who claimed that it offered the kinds of colours not seen in the West since the demise of original Technicolor. After the traditional Technicolor process was replaced by cheaper Eastmancolor etc., one of the Technicolor plants (the one in the UK) was stripped and the equipment sold to China. It is claimed that this was the equipment used to process the negative for Judou. The ‘portrait painting’ of Judou can be related to the ‘landscape painting’ of Yellow Earth. In Judou the effect is (according to Kwok Wah Lau) of “highly idiosyncratic expression” forcing us to react to the terrible consequences of the patriarchial oppression suffered by Judou. (Mary Farquhar (2002) points out, however, that Zhang’s beautiful women are not just to be looked at in the patriarchal gaze, “. . . these women also look back and in actively looking they also choose their destinies.” The ‘landscape’ approach in Yellow Earth is of a more distanced contemplation. However, the films are complementary in that both effectively critique the official socialist realism that characterised Chinese Cinema from the 1950s onwards. They were therefore both open to the charge of ‘negative portrayals of rural Chinese life’. Judou appeared in the West (and was banned in China) not long after the Tiananmen Square uprisings of 1989. Because the film is so ‘open’ to interpretation in its presentation and storytelling, it is possible to read the narrative as both/either a condemnation of feudal patriarchy (subsequently overthrown by the PRC) or of the ‘old men’ who repressed democracy on 4 June 1989. This entry was posted in Chinese Cinema, Melodrama and tagged Gong Li, Zhang Yimou. Bookmark the permalink.